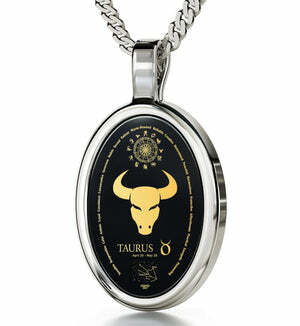 Silver Taurus Pendant, Thrill a Taurus You Love Now with Nano Jewelry! 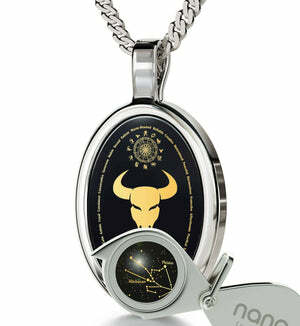 Affirm your favorite Taurus’ protective and affectionate nature with this unusual necklace! Reliability, determination and patience – these are the traits of a Taurus we can all get behind. Gentle protectors and loyal companions alike, they put others before themselves and sincerely mean it. 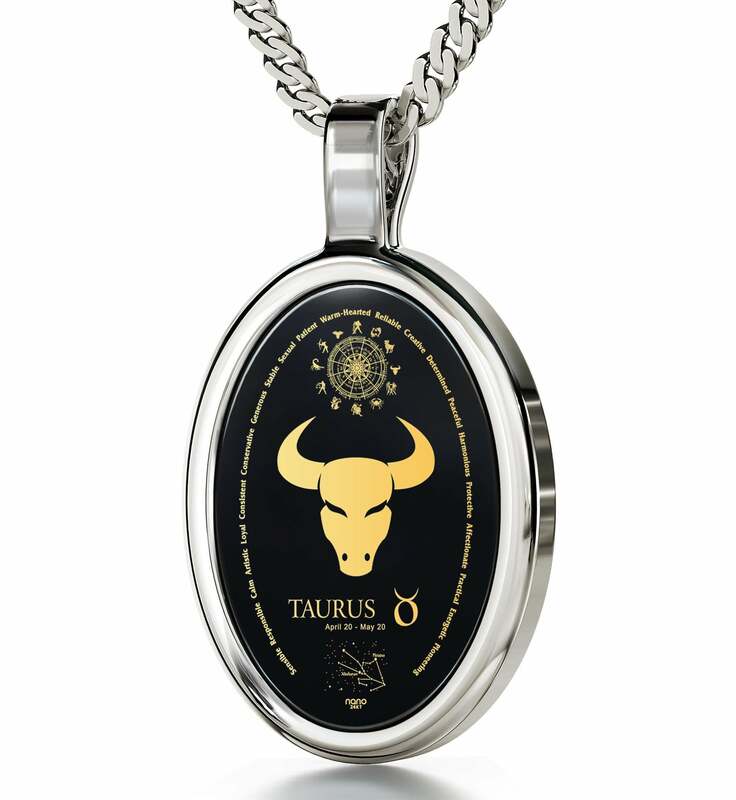 Giving something back to such a wonderful person is called for from time to time, so if you’re looking for a birthday surprise for her or a great gift for him, why not affirm these traits in the form of a special Taurus pendant? 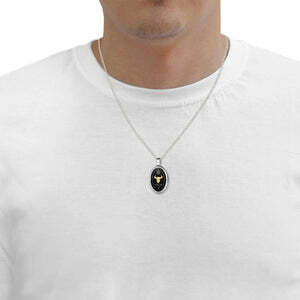 On the surface, it is similar to other pieces of fine silver jewelry you might encounter in an upscale store. Closer inspection reveals an exquisite Italian chain and oval frame, and, more importantly, a jet-black onyx stone that provides contrast and balance. It isn’t an ordinary soulless jewel though – on it lies an imprint of pure 24k gold made possible by a special process that ensures the golden adornment will never fade away. This is one-of-a-kind stuff, not available anywhere else. Depicted are Gugalanna, the Mesopotamian bull of the heavens, the Taurus constellation, its Greek name, symbol, birth dates, personality traits and the entire Zodiac. Discovering all of these in smallest detail will be fun and exciting thanks to an elegant magnifying glass that’s also part of the package. 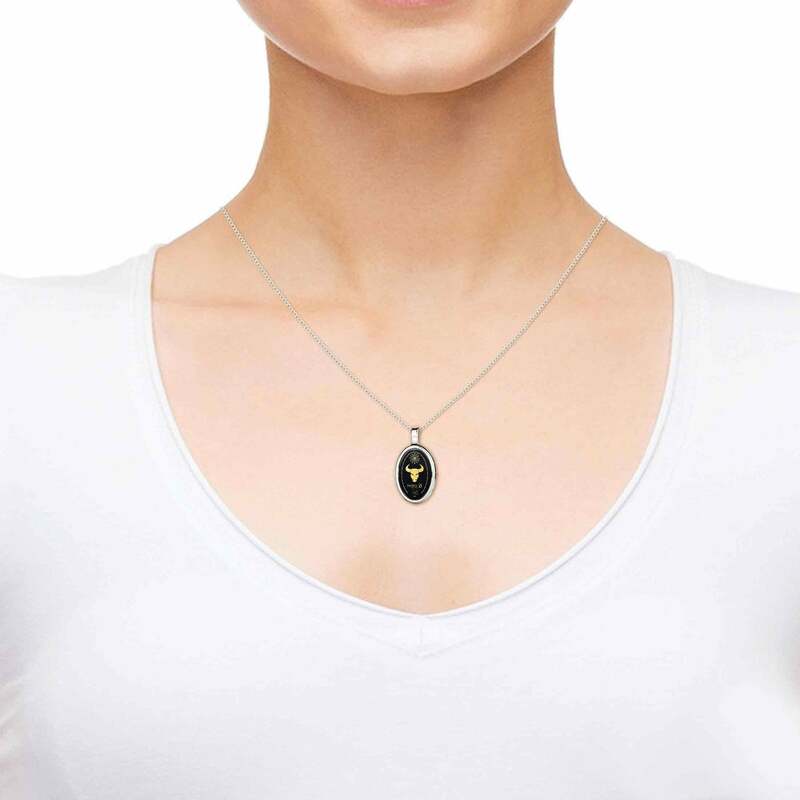 Speaking of packages, the pendant is lovingly placed inside an exquisite box that is almost as intriguing. 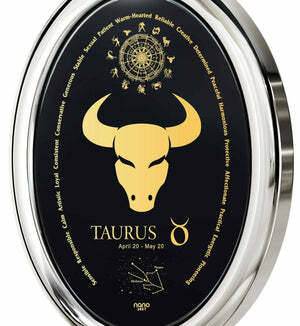 Taurus can be stubborn sometimes and like to pursue their own paths in life. Wherever this might lead them, they’ll be reassured that you approve of them whenever they gaze into this beautiful pendant.